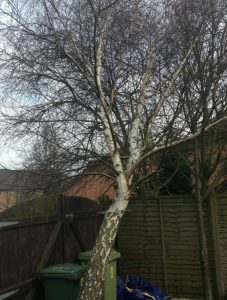 Birch tree that had sliped at the base. If you have any concerns, require immediate or remedial work please do not hesitate to contact us. 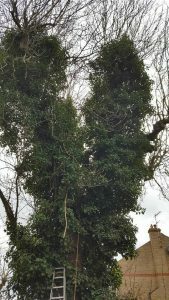 Heavily colonised with ivy this over mature Ash tree (Fraxinus excelsior) was pruned back to previous reduction points and had the ivy removed. 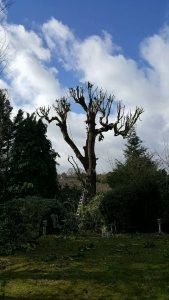 With a history of heavy pruning, old Inonotus hispidus fungus brackets present and large cavities we recommend to stabilise the tree as best we could. 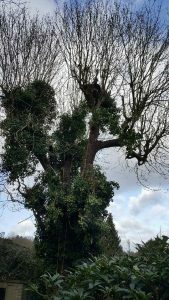 Now the tree is clean a tidy with plenty of weight alleviated we can continue to monitor the tree for future development. 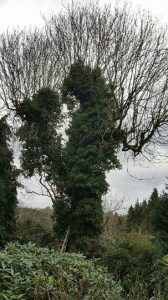 Ivy is excellent for wildlife, however it adds substantial wight to the tree and in time hampers the trees ability to photosynthes but most importantly makes it very difficult to assess major component’s of the tree when carrying out a visual tree inspection. Inonotus hispidus causes bark death, and causes the timber to become brittle. 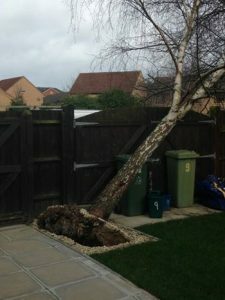 This can lead to fractures of branches and stems. Inonotus hispidus is classed as a white rot decay fungus attacking both cellulous and lignin at a similar rate. The fruiting bodies enter the tree through wounds on the branches and trunk and decompose the heartwood.